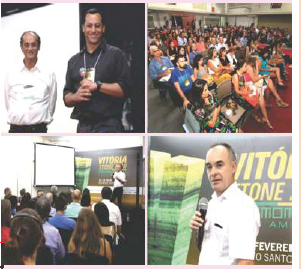 During the 41st edition of Vitória Stone Fair, the largest fair of dimensional stones of the Americas, national and international experts talked about exporting solutions to the United States, architectural projects and experiences on the use of natural stone in Germany and Europe. Export opportunities, architectural projects and experiences on the use of natural stone in Europe were some of the topics discussed in the seminar. “Innovation in Architecture and Design” was the theme of the seminar with the renowned architects Luiz Eduardo Indio da Costa and Guto Indio da Costa. They presented the current projects in the city of Rio de Janeiro and the facilities for the Olympics, as well as the work they have done on Copacabana beach in Rio de Janeiro. The CEO of DNV (Deutscher Naturwerkstein-Verband), the German Association of Natural Stone, Reiner Krug, also presented a seminar speaking about "Sustainable Construction: Building with Natural Stone", emphasizing the applicability of the stones in German market and how it could be sustainable saving energy. In addition, cases presented as one of the first commercial buildings in Europe to receive the LEED certification from the US Green Building Council, from United States. The book, Effective Marketing of Dimension Stone 2015 by K. Vikram Rastogi, International Consultant, was released at a well attended seminar on "Natural Stone in Architecture" held on 4th February, 2016 during STONA 2016 in Bangalore. Renowned architects who were presenting their papers, namely Ar. Leena Kumar, Chairman, The Indian Institute of Architects, Karnataka Chapter; Mr. Potjo Widodo & Ms. Shubhra Mutreja, Belt Collins International Pte Ltd., Singapore; Ar. Padmashri Gopal Shankar, Habitat Technology Group, Thirvananthapuram; Ar. Jyoti Gupta, Larsen and Toubro Construction, Bengaluru; Dr. Ravindra Nagar, Dean, Academic Affairs & Prof. of Structural Engineering, Malviya National Institute of Technology, Jaipur; and Dr. Pawan Kalla, Professor, Malviya National Institute of Technology, Jaipur along with Mr. R. Sekar, President, Federation of Indian Granite and Stone Industry, released the book. While the author highlighted the contents of the book, Mr. R. Sekar narrated the importance of this book in the present context when no such authoritative compilation/book/handbook is available for Indian quarry owners, processors, exporters, importers and traders. He opined that this book would serve as a guide for exporters for venturing in to virgin markets all over the world.